Yinsh is probably the easiest of the GIPF games to learn. The goal of the game is to capture three rings of your own color. 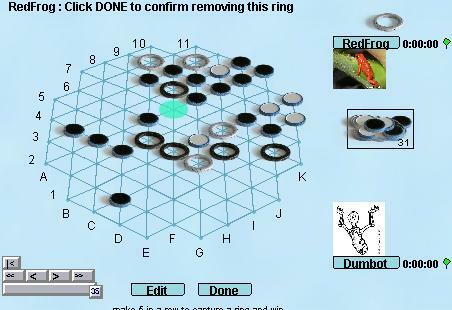 You first place five rings on the board, then each move pick a ring to move. Moving a ring leaves a chip behind, and changes the color of all the chips it passes over. Whenever a row of 5 chips is created, they are removed from play, along with a ring of the same color. There are a few subtleties in the rules, but that's the basic idea. This looks vaguely similar to Othello, but it is much subtler because removing the chips creates new open space, and removing a ring (progress toward winning) weakens you. Robots: The robots for yinsh are smart enough to win against beginners, but can be beaten once you get used to the colors changing. Basicly the robots are very good at keeping track of all the flipping, but relatively clueless about overall strategy. The back story: After implementing the first few games, continuing with project GIPF seemed a reasonable next step. Yinsh and Dvonn were available on BSW, but I thought (and still think) the interface there is awful. Yinsh won the mental coin flip to be next.